Positivecavalier.com are advertising puppys for sale online. They use stolen credit cards and invent identities to defraud people shopping for a cavalier king charles spaniel puppy online. The “breeder” will ignore any questions about their affiliation with any clubs or organisations, and questions about the puppy’s parents. The main focus now is convincing you to pay as soon as possible. The puppy will be shipped to you by the scammers perferred delivery company. There is no other option. If you insist on picking up your new cavalier king charles spaniel they will eventually agree. It makes no difference to them if you travel for 4 hours because they are not at the address they claim to be. 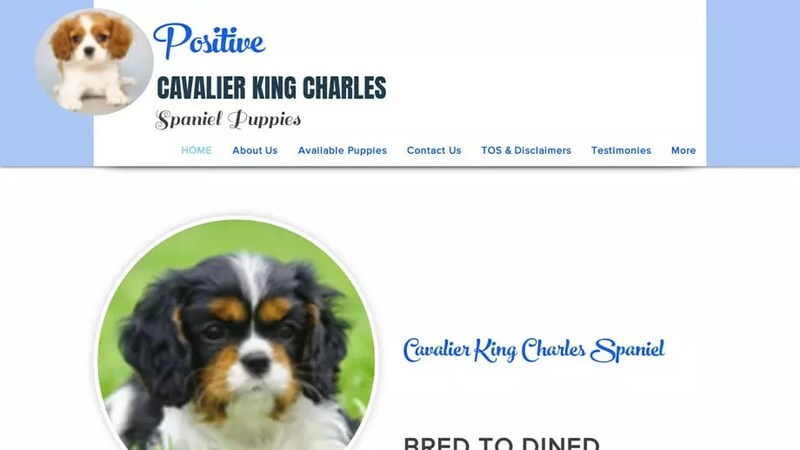 Positivecavalier.com will claim to deliver the puppy using a Fraudulent Delivery company which is actually another scam website they set up in order to steal your money by charging for non existent delivery, a air conditioned travel crate, medical insurance for your puppy as well as multiple other fees. To see more scam websites involving cavalier king charles spaniel puppys have a look at Cavalier King Charles Spaniel Puppy Scams. Positivecavalier.com was registered on April 10, 2019 with NETWORK SOLUTIONS, LLC. .
Positivecavalier.com was registered using the email address 7urr6ljpeejkobemsdojm92c0p@domaindiscreet.com. It was registered and 4 days ago on April 10, 2019 and expires April 10, 2020. To look at it another way, this “company” only started April 10, 2019 and does not plan to be using the website after April 10, 2020 as it has only a 1 year registration. Positivecavalier.com was registered with the domain registrar NETWORK SOLUTIONS, LLC..
To send an abuse report to NETWORK SOLUTIONS, LLC. please click the red button below and complete the email to help shut down Positivecavalier.com! Thanks for getting in touch with us in regards to our Cavalier King Charles Spaniel Puppies. Cavalier king charles are one of the best creatures on earth and we enjoy every moment we spend with these little angels. We hope you’re going to be one of the lucky person or family to take home one of our puppies. Our adorable cavalier king charles puppies are $650 each , $150 for shipping and home delivery cost an extra $50 but is optional.they come with all health records including, 1 year health guarantee certificate, registration paperwork’s food manual and AKC paper works. As for payments and delivery we do not accept COD, but payment is made upon confirmation of a flight and tracking number I will provide to you after registration. Delivery is same day , delivery overnight delivery/next day delivery and is 100% secured,Since the agents of the delivery agency takes very good care of the puppies and they are all up to date with their shots. We are located in Pennsylvania. Are you a breeder ? Do you have any experience in raising puppies (or pets in general)? Are you morally and financially prepared for them? Give me a description of your living environment ? Who will look after the puppies when you are not around? Which of the puppy/puppies are you interested in ? read from you soon at your earliest convenient.